Large air-conditioned studio comfortable, ideally located in the heart of the famous village of Monticello in the region of Balagne just 5 minutes from the most beautiful beaches of the island, private terrace with trees. 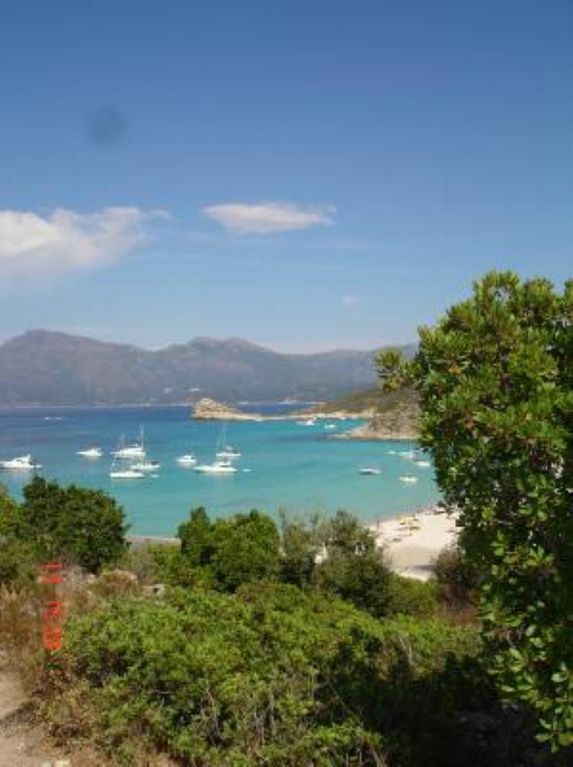 Balagne is 75km of rugged coastline and 300 days of sunshine per year. The weevil coastline with a succession of coves with clear waters and white sand beaches still surprised by their beauty the greatest travelers. Long beaches with calm waters and craggy coves ... you choose. In 40 minutes by car you are in grandiose and wooded canyons with flowing streams with clear water (Bonifato, Melaja, Fango, etc.). In the Corsican mountains, hiking, swimming and outdoor activities you open the arms (canyoning, climbing, via ferrata, etc.). Deposit check of 200 euros: NOT CASH and returned the day of departure. For more information: 0626854614. We were not sure what to expect from the property but found it to be very rustic and minimal. Surprised to have to pay extra for towels and bed linen also for cleaning of the apartment which was quite a considerable sum. In fairness we were given the choice to clean the apartment ourselves, which we did. This is something we have never experienced before! The property is adequate in size for two. Beware the stairs to the bedroom are very narrow and steep. The village is conveniently located, however, parking in high season can only be described as a nightmare! The owner was helpful and polite. We had a great holiday but admittedly we spent most of the days and evenings out. je vous remercie pour votre commentaire. vous ne saviez pas à quoi vous attendre de la propriété mais pour cela il suffisait de lire l'annonce et regarder les photos. les conditions de ménage et location de draps/serviettes sont indiqués dans l'annonce. Schönes Studio abseits vom Tourismus, direkt am Dorfplatz gegenüber der Kirche gelegen. Auch wenn die kleine Terrasse zur Straße ging, konnten wir uns gut erholen und due Abende mit einem Wein genießen. Die Vermieterin war sehr freundlich. Eine herrlich gelegene Ferienwohnung in einem alten Bergdorf, unmittelbar am zentralen Dorfplatz, einschließlich Kirchengeläut. Die Wohnung ist klein, aber umfänglich ausgestattet. Es gibt eine Klimaanlage und einen super ausgestatteten Küchen—Bereich. Das Schlafzimmer liegt oben im Appartement, leider etwas dunkel, weil kein Fenster, aber durchaus lauschig. Die Terrasse ist schön, man sitzt quasi mit auf dem Marktplatz — versteckt hinter Rhododendren, das hat was. Die Vermieterin spricht nur französisch, ist supernett und sehr hilfsbereit. Uns hat es sehr gut in dieser Ferienwohnung gefallen. Charmant petit studio idéalement situé sur la place d'un très joli petit village typique et à quelques minutes seulement des plages. La propriétaire est très gentille et de bons conseils. Je recommande vivement, nous avons passé une semaine de vacances parfaite. "Appartement très agréable au centre d'un charmant village. La propriètaire est très disponible. Le village est idéalement situé pour des excursions ou les plages toutes proches..."
"Il paese é molto carino tranquillo e silenzioso non presenta alcun tipo di attrazioni nè negozi, solo un bar-ristorante nella piazza e una piccola salumeria, ma è a pochi minuti di macchina dall'' Ile-Rousse (paesino turistico molto grazioso) e quindi dal mare. La casa è bella e accogliente con una piccola terrazza che affaccia sulla piazza del paese dove poter cenare e fare colazione.Pulita e non rumorosa. L''unico difetto che potrei trovare sono le scale un po ripide non adatte a persone con difficoltà motorie." ferries from Marseille / Toulon / Nice and Italy to Ile Rousse or Calvi. Direction Ile Rousse and Monticello to the village square. The owner is there to advise you during your vacation. supplément chauffage selon la saison, caution demandée, acompte/arrhes à la réservation, remise des clés par le propriétaire Location de linge de lit et serviettes de toilettes : 15€ par séjour par lit frais de ménage final inclus dans le prix de la location. Chèque de Caution de 200 euros: ,NON ENCAISSE et restitué le jour du départ. Pour plus de renseignements : 0626854614.